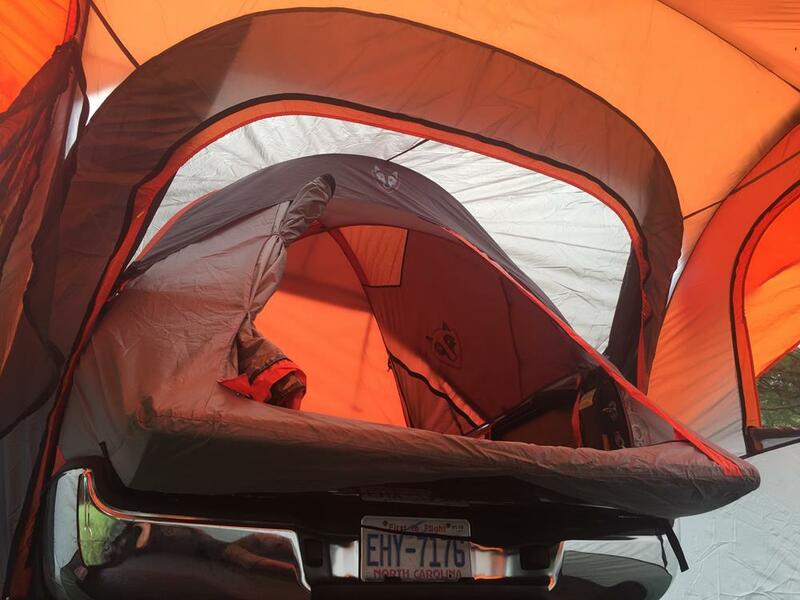 Have you ever wondered if the Rightline Gear SUV Tent can connect to the rear of the Rightline Gear Truck Tent? If so, you are not alone – we actually get that question quite a bit. We are pleased to report that the answer to the question is YES! 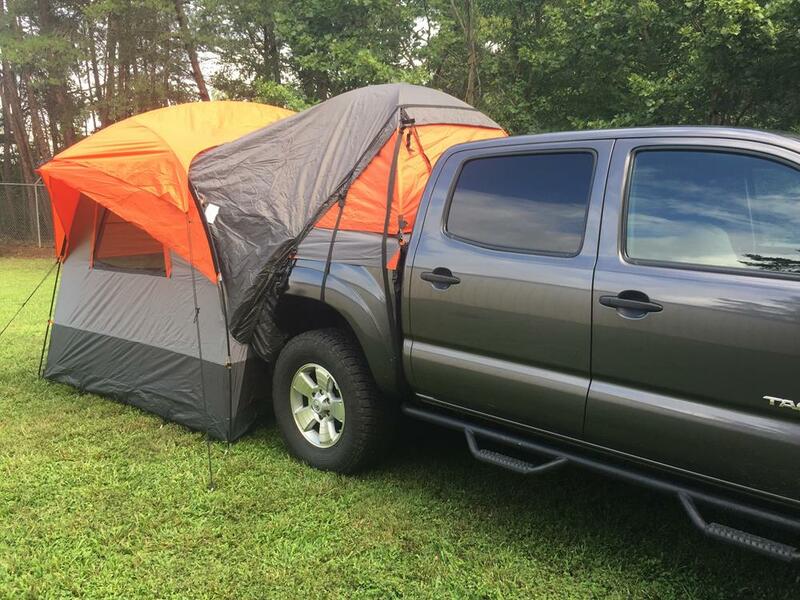 Here is our Mid Size Short Bed Truck Tent, 110765, on a Toyota Tacoma with the SUV Tent attached to its rear. You can see that the vehicle sleeve of the SUV Tent extends to the cab side of the Truck Tent’s peak. The vehicle sleeve reaches this far on the small Toyota Truck/Truck Tent. On larger Trucks/Truck Tents, the vehicle sleeve will stop at the peak of the Truck Tent or even closer to the rear pole of the Truck Tent. The SUV Tent seals tightly around the Truck Tent to keep bugs, wind, and rain out. The tailgate of the truck extends into the interior space of the SUV Tent. Now you can sleep up off the ground in the comfort of your truck bed, but still have tons of room to dress, store your gear, bring along a bunch of kids, etc. Try out this great set up and be sure to send us photos of you and your people! Hello Jody. Our Truck Tents have a retail price of $179.95. I have a 2011 Honda Odyssey Touring. I need to know if this Rightline Gear Truck Tent and SUV will work on the van. We are recently retired and really want to go camping but in our van, not a big trailer. Hello. The SUV Tent will fit your Honda Odyssey well. The Truck Tents will not fit your van as they are designed for trucks. The tents can ship in a box that is 24″ L x 10″ W x 10″ H. This is roughly the size the tent is when it is packed into its carry bag. Hello. We are sorry to report, but our Truck Tents do not fit the 2019 Honda Ridgeline. The Ridgeline features a design in which the truck cab and truck bed are attached to one-another. This is unique to the Ridgeline. Our Truck Tents require a space between the truck cab and truck bed in order to fit properly. Our Truck Tent sleeves around the front and sides of the bed, and unfortunately it cannot work on the Ridgeline. 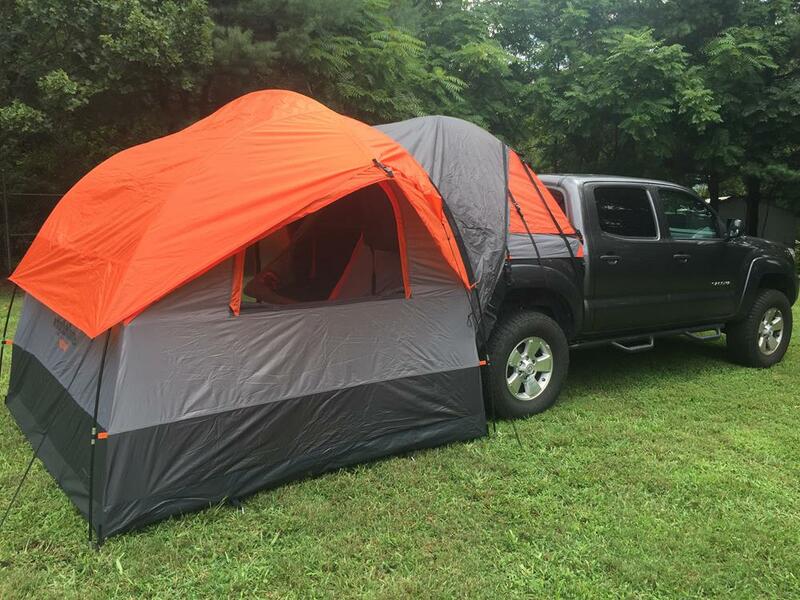 I was looking for a truck tent that was simply more than just the part that goes over the bed. As your article above says, that area is nice to sleep in, but you need privacy and room to get up and get dressed and what not and some type of extension is needed. This setup looks like it could work well. Do you have instructions for using both together? 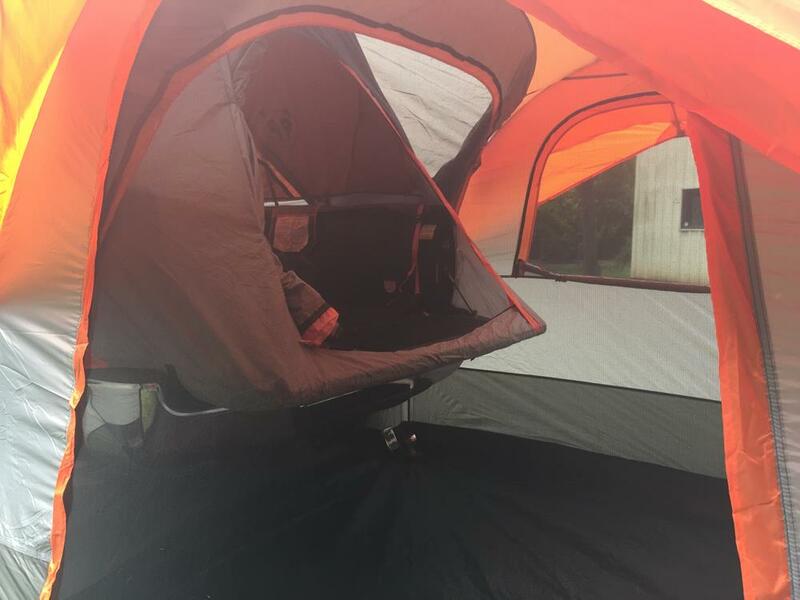 It seems like there should be instructions, or a video of how best to use these 2 separate tents together. Thank you. Hello Jeff. 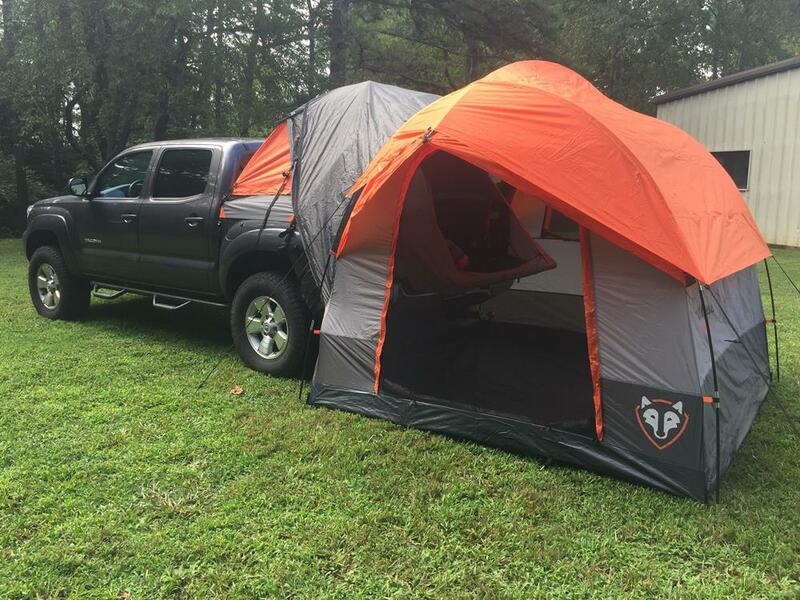 We haven’t written detailed instructions for how to attach the SUV Tent to a Truck Tent, but rest assured the setup guide included with both the SUV Tent and Truck Tent should be enough for you to successfully attach both tents.